I got the call about a heavily pregnant cat (Jasmine) just as my colleague Margaret and I were dashing to a vet’s appointment. It sounded very urgent and I suggested to the caller that we would come immediately after our consultation. I called her seven times that afternoon to get the address but she had switched off her phone accidentally. By the time I finally made contact it was night time and too late as the cat had disappeared. Next afternoon Jasmine walked straight into our trap and it was true – she was ready to pop! Apparently she had been there since the houses were built some three years previously. The feeder said that she had called two well know rescues at least seven times over the years about these cats but nobody came. There had been two cats, both of which had litters twice a year. The kittens always disappeared. The feeder assumed that they were eaten by the many foxes in the area. 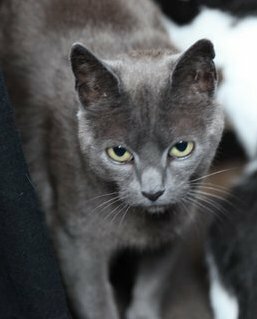 The second cat then vanished, leaving her two kittens alone. Jasmine took on the little ones and reared them. They managed to survive and are healthy. I quickly got her settled in a large quiet pen with a cosy birthing box. She seemed to be fine but was probably traumatised. During the night she began to demolish the box. She managed to spill the water bowl which in turn softened the base and the sturdy box was about to collapse. I decided to change it for a large plastic carrier – that was when I found the newborn kitten. We had indeed got her in the nick of time. 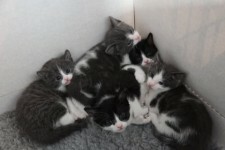 She proceeded to have four more lovely babies- two grey and white and three black and white. Two of them were polydactyl – they had extra toes on all four paws. Jasmine was a natural attentive mother and nursed the kittens with great tenderness. She also adored kitten milk and drank it by the bowl full. When the kittens were about sixteen days old I became concerned about little Smitten. Her back legs did not appear to work correctly. Sadly I was proved right but she was not incontinent, as often happens in a case like that, and she had feelings in her feet, so there was hope for her. I massaged the little legs and, on vet’s advice, put all sorts of different surfaces down to stimulate her little paws. By four weeks old she was almost keeping up with her siblings using three legs. Then disaster struck – she was in terrible distress and sadly we had to let her go. Hopefully now she is running free. Absolutely everyone was in tears – nurses, vets, receptionists and me. The little family continued to make great progress and soon it was time for Jasmine’s operation. I had prepared her by slowly gaining her confidence and at this stage I could not only stroke her but she also allowed me to gently lift her a few inches off the floor. This was great as I was able to very quickly put her in the cat carrier before she knew what was happening. Adele our vet asked if she could X-Rray Jasmine while she was “under”. She’d been having a bit of bother with fur balls. We feared that there might be a slight blockage in her small intestine. That was when we found the air-gun pellets. Four air gun pellets were embedded in the poor soul. One was in her shoulder, one in each elbow, and yet another inside her belly. She had been used as target practice. Adele decided to leave the pellets alone as the body doesn’t really absorb them unless they are in the blood stream or stomach to digest them. One could be removed easily but the others would be too difficult to find and they could cause more damage by trying to remove them than by leaving them. Smitten’s problem was unrelated to the pellets. Jasmine‘s operation has knocked her confidence quite a bit but with the help of her favourite treats it will come back. I intend to keep her as a sort of foster mother in the kitten room (she already pinched another cat’s kittens and helped to rear them) until that “very special” home comes along. She is very special and only deserves the very best. All her kittens got wonderful homes.